Have you applied for Technical Graduate Course (TGC) of Indian Army and looking for TGC SSB interview dates? Indian Army has announced SSB interview dates of Bhopal SSB centre. Read on to know about TGC 117 course SSB interview dates at Bhopal. Indian Army has recently announced TGC SSB interview dates of Bangalore. After a short period of time, Army officials have uploaded the SSB dates of Bhopal centre today. Technical Graduate Course or TGC is a course specially conducted for engineering graduates. All passed out candidates of TGC course will become technical officers in Indian Army. If you are not shortlisted in TGC 117 course for SSB interviews, there is an opportunity for you to become a technical officer of Indian Army through SSC (Tech) courses announced recently. Indian Army offers decent salaries to the technical officers along with strong technical knowledge. In order to become esteemed officer in Indian Armed forces, one needs to clear SSB interview conducted by Service Selection Board. TGC 117 course will commence in July 2013 in Indian Military Academy (IMA). There are total 8929 candidates whose SSB interview will be held in Bhopal centre. 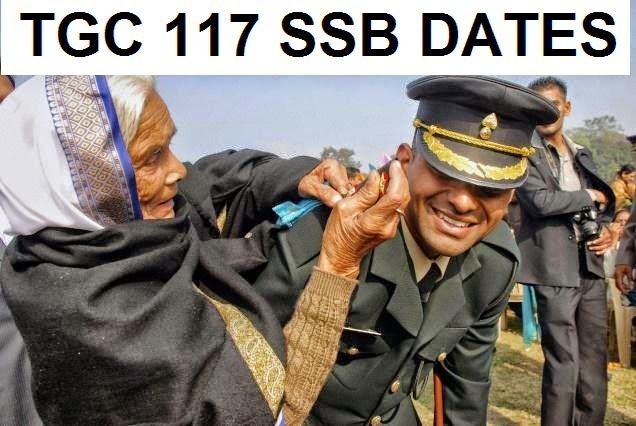 First SSB interview of TGC 117 course will start on 14th April 2013. Those who fail to attend interviews at specified dates, Indian Army has allotted 18th May 2013. So till now Indian Army has released SSB dates of Bangalore and Bhopal entries. Allahabad SSB centre's interview dates for TGC course are still awaited by all aspiring candidates.